Senator Menendez follows Schumer's footsteps in announcing opposition to Iran nuclear deal, raising hopes of defeating Obama's veto. 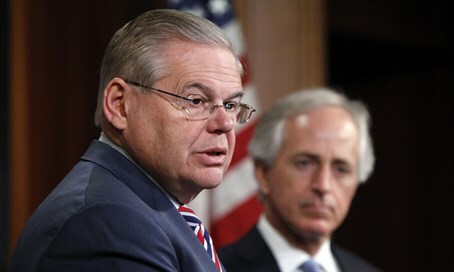 Senator Robert Menendez (D-NJ) on Tuesday announced he will oppose the Iran nuclear deal, become the second Democrat to announce his rejection of the agreement after Senator Chuck Schumer (D-NY) previously did so. Menendez announced in a speech that the deal would allow Iran to become "flush with money," that it could use "to further pursue their destabilizing hegemonic goals in the region." "We want the right deal and a deal that does nothing more than delay the inevitable is not a deal we are willing to make," he stressed. The announcement is significant given that US President Barack Obama is relying on Democrats to prevent a 2/3 majority in Congress from being able to block his veto, as he tries to force the nuclear deal through despite strong opposition. Congress has until September 17 to vote on the deal. If all Senate Republicans oppose the deal, 13 Democrats will also be required to override the veto - now with Menendez, only 11 more are needed. Senate Minority Leader Harry Reid (D-NV) has been holding off on announcing his stance on the deal, after indicating he intends to talk with influential Jewish backers before deciding. Reid is among seven Democrat senators listed by The Hill as "leaning" toward supporting the Iran deal, but it is possible that in talks with the prominent Jewish backers he could be convinced to oppose the deal, a move which would have great impact given his prominent position. Another 21 out of the total of 44 Democratic senators now publicly support the deal, while 17 are "unclear/undecided" and would probably be influenced by Reid's position.